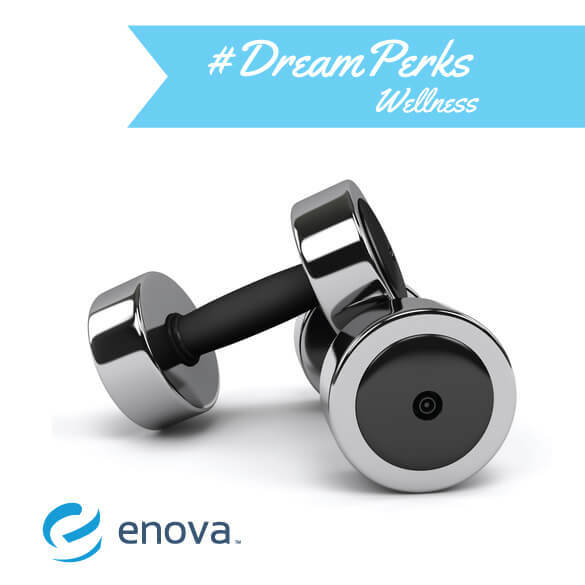 Enova Employee Wellness and DreamPerks - Enova International, Inc. Whether it’s with free and easy access to state-of-the-art electronics or a spot on the intermural soccer squad, Enova does everything it can to ensure its employees remain eager and excited as they work to make the company great. This is why Enova has assembled such a large quantity of perks, benefits and discounts for each and every one of its employees to enjoy. Taking care of your body is an important step in taking care of your mind, and at Enova, employees are provided every opportunity to do both. With negotiated discounts at a number of Chicago fitness centers, including Chicago Athletic Clubs, XSport Fitness, LA Fitness and Go Performance & Fitness, Enova encourages all of its workers to get a workout before work, or after. The building’s Chill Hub offers Enova employees the perfect relaxation space, along with regular yoga sessions and a collection of electric massage chairs available 24 hours a day. According to Product Manager George Savvas, “I went into yoga with low expectations, but now I never miss a session! It really helps me focus both at work and at home.” Employee wellness is no joke at Enova, and the company is always looking for more ways to improve the wellness offering. Which has lead to DreamPerks, a Twitter-based engagement campaign that asks you, the Enova followers and fans to help the company brainstorm. Between September 9th and October 23rd, Twitter users will be asked to tweet @enova with their biggest, boldest and best idea for the “perfect perk.” This can be a vacation spot, an office accessory, or a wacky, office-specific holiday, but whatever it is, be sure to add the #dreamperks hashtag and Enova will consider the idea for a chance to win $140. Tweet your #dreamperk today! NO PURCHASE NECESSARY TO ENTER OR WIN. A PURCHASE WILL NOT INCREASE YOUR CHANCES OF WINNING. Void where prohibited by law. This is a skill-based contest. Contest is open only to individuals who are located in the 50 U.S. or D.C. and at least age of majority in place of residence. Contest begins: 9:00am CT on [9/9/13]; ends at 11:59pm CT on 10/23/13. Winners will be selected biweekly throughout the entry period. When selecting winners, sponsor-selected judges will review submissions based on the following criteria: (a) 33.3% clarity of expression; (b) 33.3% creativity; and (c) 33.3% originality. ARV of each prize: $140. Subject to full Official Rules, available at [Insert URL]. Use of designated hashtag is deemed acceptance of the Official Rules. Limit of 5 entries per person. Sponsor: Enova Financial, 200 West Jackson, Suite #2400, Chicago, IL 60606.